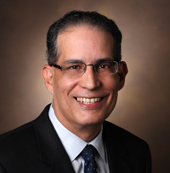 Walter Frontera, M.D., Ph.D., professor and chair of the Department of Physical Medicine and Rehabilitation (PM&R) at Vanderbilt University Medical Center (VUMC), will step down from his role as the department’s leader on Feb. 28. Jeffery Johns, M.D., associate professor of Physical Medicine and Rehabilitation and medical director for Vanderbilt Stallworth Rehabilitation Hospital (VSRH), will serve as the department’s interim chair while a committee conducts a national search for Frontera’s successor. Through his leadership Frontera built a strong foundation for the newly created department, establishing and integrating new programs and services at VUMC in rehabilitation. As inaugural chair, Frontera has been responsible for the creation and growth of research, training and clinical services in physical medicine and rehabilitation for the Medical Center, as well as oversight for clinical and academic programs at VSRH. Through the Vanderbilt University School of Medicine (VUSM), PM&R offers educational programs for students pursuing careers in multiple related disciplines. The Department of PM&R currently includes 41 faculty and 200 staff. Newly created patient services offered through the department include an outpatient clinic located within VSRH, along with PM&R’s presence in five other outpatient clinics at off-site locations throughout VUMC’s health system. In addition, the department now provides consultation services for some of Vanderbilt University Adult Hospital’s (VUAH) acute care units. “It is clear that a significant number, close to 40 percent, of our patients at VUMC need rehabilitation services after hospitalization. The Medical Center’s leadership understood this and established the department to address that gap. From a clinical point of view we have developed a portfolio of programs that have become an important part of the Medical Center’s enterprise which offer outstanding service to these patients,” Frontera said. “Dr. Frontera’s contributions have been enormous. Without question, he has been the right individual to lead the Department of PM&R out of its infancy and we are grateful for his many accomplishments. The work Walter has done here will continue to benefit the Medical Center and our patients for decades, adding to his legacy as one of the pioneers in this field,” said Jeff Balser, M.D., Ph.D., President and CEO of VUMC and Dean of VUSM. Through PM&R, patients at VSRH admitted for medically complex conditions and traumatic injuries receive the benefit of Joint Commission-certified specialty programs in stroke, traumatic brain injury and spinal cord injury. The department’s faculty are pushing boundaries to advance the level of care in sub-specialty programs for transplant and burn patients as well. The department’s clinics work closely with VUMC’s other multispecialty centers including Pain, Spine and Sports Medicine. A new service to provide outpatient PM&R services for children with disabilities has also been developed. Frontera said the department’s most important contribution to education and training is the establishment of a residency training program. “We already have two classes of four residents each that are in training now. This year, we have received 510 applications from medical students for four positions that are available next year. We are now interviewing candidates from all parts of the country,” he said. Including its residency training program, faculty in PM&R teach students at many levels including undergraduates, medical students, doctoral students in the biomedical sciences and nurse practitioners who are pursuing careers in variety of health care professions. The department’s education programs grew from 20 students in 2013 to 178 in 2016. Frontera is also proud that all six of the department’s principal investigators have National Institutes of Health research funding. “Our goal is to generate new knowledge. As an example of the growth in this area, the number of publications in our department has increased from seven in 2014 to 38 through December 2016,” he said. Research published by PM&R’s faculty focuses on such topics as: exercise and aging, healthy behavior changes, limb loss rehabilitation and rehabilitation engineering, lymphatic imaging, outcomes for procedures performed to treat musculoskeletal disorders, neuromuscular physiology and contemplative neuroscience and integrative medicine. “The department’s successes in many areas represent the hard work of a lot of people, along with the significant support of the Medical Center, the School of Medicine, and many other department chairs,” Frontera said. “I want to express my appreciation for the outstanding work of my colleagues including Dr. Stacy Stark, the program director for our residency training; Dr. Nitin Jain, director of Research; Dr. Jeff Johns, medical director for the Stallworth Rehabilitation Hospital; Dr. Aaron Yang, the medical director for Stallworth’s Outpatient Services; and Mack Howell, the Administrative Director and his team. We are a great team and I am proud to work with each of them,” said Frontera. “I am also happy and proud of the fact that faculty in this department are actively participating in our national organizations and meetings. I really believe we can become one of the leaders in the country in our field,” he said. “The leadership of the Medical Center, the School of Medicine and the University has been terrific in supporting our mission, goals and strategic plan. I have had a very good time here. It looked like a very interesting challenge back in 2011 and 2012, before I was appointed, to develop a new academic department in times where health care and health systems are constantly challenged and can be unpredictable. “One of my goals was to make a contribution not only the Vanderbilt, but also to the field of PM&R. I think that having an academic department in an excellent medical center such as Vanderbilt represents that contribution,” Frontera said. Prior to joining Vanderbilt, from 2006-2011 Frontera served as dean of the Faculty of Medicine at the University of Puerto Rico. He also served as the first professor and chair of Harvard Medical School’s Department of Physical Medicine and Rehabilitation from 1996-2006. In addition to his pioneering work as a clinician, educator and researcher in the field of physical medicine and rehabilitation, in 2008 Frontera was elected to the Institute of Medicine of the National Academies. He is the recipient of numerous awards for his contributions to the field of PM&R. In 2015, he was presented with the Gerontological Society of America’s Excellence in Rehabilitation of Aging Award. In addition to spending time with family, Frontera will return to the faculty of the University of Puerto Rico, where he will continue to conduct research and work on the next edition of his textbook, “Essentials of Physical Medicine and Rehabilitation.” He will also be working with the International Society of Physical Medicine and Rehabilitation serving as the society’s president.